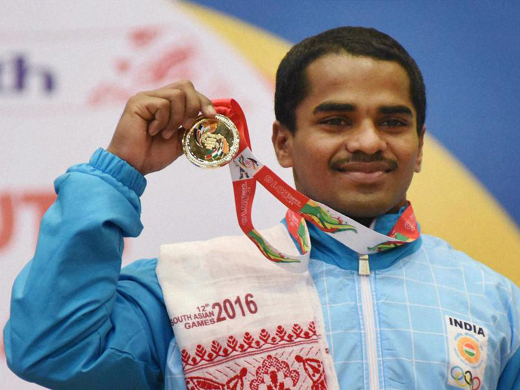 Udupi, Feb 7, 2016: When Gururaja won gold in the 56kg category in weightlifting on Saturday at the 12th South Asian Games in Guwahati on Saturday, there was jubilation in a humble household in the tiny village of Chittoor in Kundapur taluk of Udupi district. This son of a truck driver made it to the top due to sheer hard work and dedication, despite all the financial hardships the family faced in the village. He is the fifth among six sons of Mahabala and Paddu Poojary. Mr. Poojary told The Hindu that the entire family was ecstatic. “Gururaja was only interested in sports since his childhood, so we encouraged him. Though sometimes it was difficult to get the money, I somehow managed,” he said. Gururaja did his schooling at the Sri Mookambika Temple School and PU College in Kollur. During his PU days, he was interested in wrestling, and learnt it under his coach Sukesh Shetty in Kollur. The turning point came when he joined the SDM College in Ujire, Dakshina Kannada, for his graduation. It was his coach Rajendra Prasad M. who encouraged him in weight lifting. “Gururaja used to practise two hours in the morning and two hours in the evening. During competitions, he used to put in two additional hours,” he said. Mr. Prasad coached him for five years until Gururaja got selected for the post of aircraft-man in the Indian Air Force under sports quota. He has been undergoing training in Belagavi for six months. Gururaja, who spoke over the telephone from Guwahati, said he owed his success to the unstinting support of his parents, and his coach Mr. Prasad. Congrats Gururaj . You are a pride to the nation.